One of the coolest features in VSCode is the ability to check your code at design time for specific things. This post will explain how you can turn on code analysis, and how to get away with breaking the rules that it tries to enforce. There are three things you have to know about code analysis: First, it is a feature that can be enabled and disabled at will. Second, there are sets of rules for specific purposes that you can turn on and off. Finally, you can define exceptions to those rules, and what to do when the code analyzer finds a violation of one of the rules. All three items are found in the user settings, and the exceptions are then stored in a separate file called a ‘ruleset.json’ file. Open the user settings from the Command Palette. You will need to have different levels of scrutiny for different projects, like one client has an on premises implementation, and another is developing an app for AppSource. These must follow different sets of rules, so they get their own codeanalyzers. Since each project is different, I would say that you define the code analysis attributes at the workspace level. You can set these features up in the sort of UI rendering of user settings, but I like to see the json file in the editor and use Intellisense there. 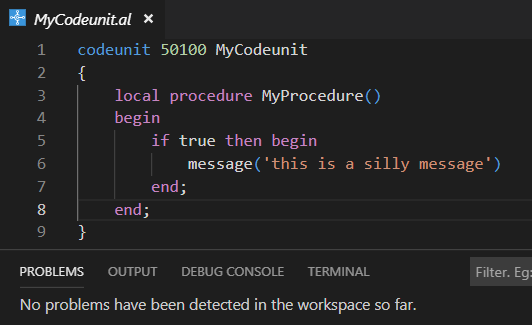 The code analysis feature is turned on by setting “al.enableCodeAnalysis” to “true”. In the “al.codeAnalyzers” property, you can define which set of rules is enabled. The one you should always enable is the ‘CodeCop’,m which enforces some basic syntax rules. Then, depending on whether you are doing development for AppSource or for a tenant specific extension you can choose either the ‘AppSourceCop’ or the ‘PerTenantExtensionCop’. You should not have both of those last two enabled at the same time, because some rules for AppSource don’t apply for PerTenant and vice versa. Code analysis doesn’t like my code, the CodeCop does not approve of using BEGIN..END for a single statement. 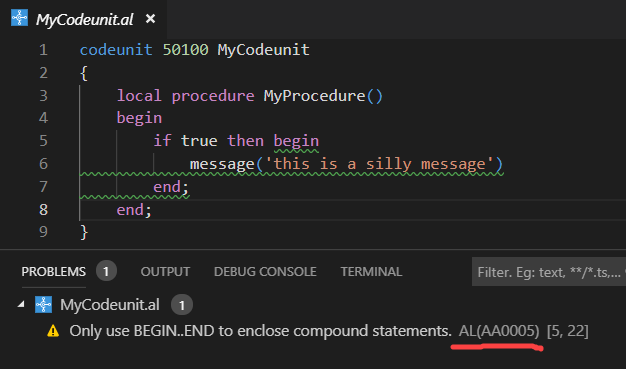 Personally I don’t agree with that rule, because I always use BEGIN..END in IF statements, I make fewer mistakes that way. The rule is not really a big problem, because the squiggly line under my code is green. If I had violated a really important rule, like missing a prefix in a field name, it would have been red. Lucky for me, I can define for myself how certain rules are handled. Note that the problems screen shows which rule is broken (number AA0005). Let me show you how you can define what happens. The rule itself still works, I’ve just overridden its behavior to something that I like. Going back to my codeunit, there is no longer the annoying little squiggly line, and this violation is no longer listed in the problems window.